Premier Li Keqiang delivers the Government Work Report at the opening meeting of the first session of the 13th National People's Congress at the Great Hall of the People in Beijing on Monday. [Photo by Xujingxing/China Daily] China's economic and financial risks are on the whole manageable, supported by sound economic fundamentals and sufficient policy tools, senior officials and analysts said on Monday. 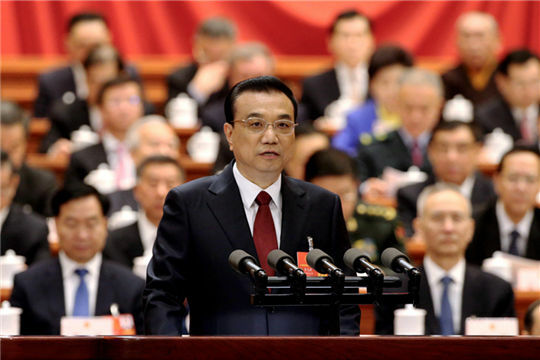 "We are fully capable of forestalling systemic risks," Premier Li Keqiang said in the Government Work Report delivered to the first session of the 13th National People's Congress. "What China needs to do is to tackle both symptoms and root causes and take effective measures to defuse potential risks," he said. Forestalling and defusing major risks is one of the "three critical battles" to ensure high-quality economic development and fulfill the government's key tasks this year. Local government debt risk, one of the key areas that may stimulate potential systemic risks, is fueled by nontransparent and illegal fundraising activities, and the government has pledged that these will be further controlled. Provincial-level governments "should assume overall responsibility for debts incurred by local governments within their jurisdiction", the report said . Huang Shouhong, director of the State Council Research Office, said on Monday that local governments'debt risks are under control.